Citation Information: J Clin Invest. 2006;116(5):1150-1158. https://doi.org/10.1172/JCI28521. Skin is at the interface between the complex physiology of the body and the external, often hostile, environment, and the semipermeable epidermal barrier prevents both the escape of moisture and the entry of infectious or toxic substances. Newborns with rare congenital barrier defects underscore the skin’s essential role in a terrestrial environment and demonstrate the compensatory responses evoked ex utero to reestablish a barrier. Common inflammatory skin disorders such as atopic dermatitis and psoriasis exhibit decreased barrier function, and recent studies suggest that the complex response of epidermal cells to barrier disruption may aggravate, maintain, or even initiate such conditions. Either aiding barrier reestablishment or dampening the epidermal stress response may improve the treatment of these disorders. 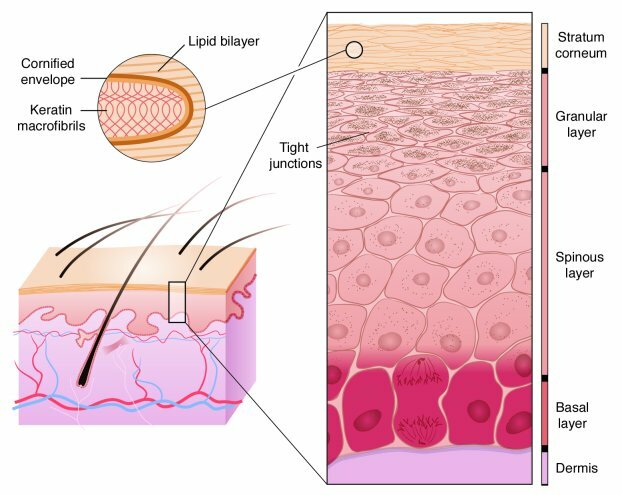 This Review discusses the molecular regulation of the epidermal barrier as well as causes and potential treatments for defects of barrier formation and proposes that medical management of barrier disruption may positively affect the course of common skin disorders. Schematic diagram of the stages of epidermal differentiation, resulting in a permeability barrier. Epidermal keratinocytes undergo a linear program of differentiation from mitotically active basal cells to transcriptionally active spinous cells to enucleated granular cells, resulting finally in differentiated squames in the stratum corneum. As shown in the inset, squames, which provide the primary barrier, are composed of keratin macrofibrils and cross-linked cornified envelopes encased in lipid bilayers. Tight junctions, located in the granular layer, also play an essential role in retaining the water content of the body.